Practical Meditations with Rebecca Petillo offers powerful, proven meditation techniques and mindfulness tools that enhance life and the enjoyment of your everyday moments. These tools include ways to establish a daily meditation routine which will encourage inner peace, strengthen relationships and enliven creative problem solving. A professional instructor with over 28 years of daily practice, Rebecca brings a sense of levity and enjoyment to the practice which encourages relaxation, mental clarity and, an overall sense of purpose and joy. Each Practical Meditation class will begin with a brief discussion about meditation as a gift for your soul. We then enjoy a gentle kind body scan. We follow this with a discussion about establishing a workable daily meditation practice. Each week we finish with a different meditation which allows each person to build their own ‘tool kit’ of practical mindfulness techniques that work for them. Practical Meditations, the ultimate “me” time which enlivens the “we” times. Space is limited, so advanced registration is requested. Exchange is $50 per person, which includes a spiral-bound journal and beginner chakra crystal set. Mary Hoyt Kearns’ mission in life is to bring Light, Love, and Healing to the world by supporting people on their journey toward mind-body-spirit wellness. She holds a PhD in developmental psychology from Fordham University, with a focus on Behavioral Health. She is a Registered Yoga Teacher, Certified Life Coach, Usui Reiki Master Teacher, and has studied herbalism, shamanism, past life regression, and more. She is the owner of Your Stellar Self. Mary has been offering wellness workshops and talks on various mind-body-spirit topics since 2003. Fun, informative class for you and your baby. Learn techniques used to promote better sleep, help regulate digestive and circulatory systems, relieve discomfort from colic and teething, and enhance bonding with your baby with the soothing power of touch. We supply a small bottle of edible, safe, natural fractionated coconut oil to use in session and to take home. Beginner class goes over basics, Advanced is a refresher class with more specific techniques and detail for babies with more problematic colic discomfort or other issue. A large towel or washable blanket. Extra pillow or cushion for support (we provide some). Group Class: Five babies max per class. Recommended for babies 0-12 months. Individual Class: Recommended for all ages and babies over 12 months. Call 202-827-8064 or email with any questions or individual session times. Known as “yogic sleep,” Yoga nidra is a conscious relaxation practice that is intended to induce total physical, mental, and emotional relaxation. Yoga nidra is generally practiced lying down so you can let go completely. Props, pillows and blankets are commonly used, as well as anything that will help you get into a totally comfortable, restful position. A typical yoga nidra practice is highly guided meditation, and takes your attention to specific places through a series of scripts and/or visualizations. No yoga experience necessary; all you need to bring is yourself and an open mind! If you love aromatic bath and body products, this class is for you! Class will start with a brief discussion on the use of essential oils in body products and some of their therapeutic values. 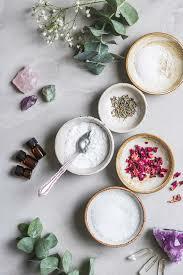 Each participant will make a customized herbal salt soak using a variety of skin nourishing base oils, dried herbs & flowers, essential oils, and natural salts. Customize and choose your own essential oil blends and combinations to create relaxing, stimulating, immune boosting, or any other inspiring products. All ingredients and bottles included.